What does your team experience most as it innovates? Without focus and inspired leadership, new ideas signal another cycle of stress to those who have to deliver. (And we all have to deliver.) 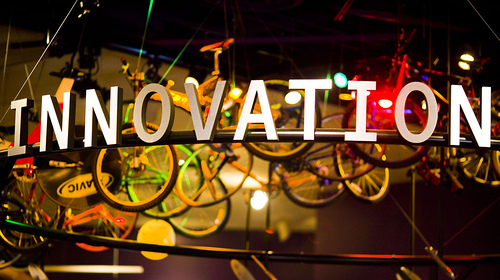 Slowly, “innovation” – an organization’s lifeblood – becomes a dirty word. What type of culture and leadership has to exist for innovation to remain an inspiring and engaging – and results producing – initiative? Unless this and similar questions are discussed as a team…innovation becomes synonymous with keep-your-mouth-shut. So true! With a commitment to innovation and re-innovation must come also an unshakable [commitment and willingness] to hear and be told the truth. If there is no room for truth there will never be room for innovation. There is a religious quote which transcends culture, and dovetails with Craig’s article-“know the truth and the truth shall set you free” to grow and evolve (innovate & re-innovate). John: Thank you for sharing how this resonates for you, and your build on the quote regarding “truth.” Isn’t is fulfilling to think about what happens when the truth sets us free to grow and evolve. Here’s to continuous innovation! Craig, you are spot on. I have worked with teams and leadership that have taken both approaches. I’m thankful that my current team (and company in general) is very strong on encouraging innovation by making continuous improvement, and the contributions / ideas of individuals, highly esteemed. The strengths of our team are continually being leveraged through the identification of opportunities for optimization and questions of “how can we make this better”. All of us have a stake and roll in both. I appreciate John Douglas’ comment. I understand him to mean that understanding the truth about *anything* will ultimately set you free to better navigate it or the situation. When we accurately understand the world, the processes, the items, etc. around us, then we can proceed to more precisely ask the right questions and put in place the best answers to meet our challenges and optimize what we do each day. James: Thanks for your leadership wisdom and thoughts. I love how you’re leveraging strengths on your team by asking questions — and building more ownership and excitement along the way. James makes a key connection between when we understand our stake and role in the project and our capacity to move quicker.